ALL OUR BOOKINGS ARE TO BE MADE ON LINE AND PAID FOR IN ADVANCE. Our Arena can be booked for a minimum of half an hour or hourly to make up as many hours in the day that are required. If booking for a Pony Club or Riding Club it is possible to email to book the hours required and pay on the day but 48hr cancellation still applies. If bookings are for longer than 3 hours a 50% non returnable deposit will need to be taken. A half hour booking at the set rate (£20.00) is for a maximum of two horses and an hour booking (£40.00) is for a maximum of four horses. Extra horses in the same group can be accommodated at a cost of £10.00 per horse for each hour required. A maximum of 8 horses per booking are allowed. Bookings can be made in half hour, hour, hour and a half or 2 hour slots. When using the Booking calendar below, multiples of each can be selected to make up the total time you require. Options are available to start your booking on the hour or on the half hour. Please check all options available to make sure you select the correct time slot. If you experience any difficulty please Contact us. Information on data protection can be found on our T's and C's. Full payment will be required on booking. You can pay via Paypal or by using a Credit or Debit Card. After selecting your date and time, you will enter your details and click Pay Now. You will then be directed to the Paypal payment page and if you would like to pay by card, please select Checkout as Guest. 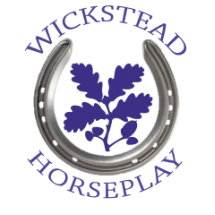 Wickstead HorsePlay operates a 48 hour cancellation policy whereby bookings cancelled with more than 48 hours notice will receive a refund (less a £5.00 Admin Fee) and bookings cancelled with less than 48 hours notice are non-refundable. By completing a booking with Wickstead HorsePlay you are agreeing to our Terms & Conditions. PLEASE NOTE: When booking in the winter months, if the temperature drops below zero, you should be aware that the water jump and part of the XC Loops may freeze. The arena can normally stand up to -3 degrees but will not be useable if it snows. Therefore it is advisable to make contact with either Hannah on 07725733443 or Georgina on 07899897022 to check if the facilities are useable. We do not have arena lighting so please ensure you consider the timing of your booking during winter months.